It's official: Merida's 'ugly'. (i.e. unappealing, disproportionate, heavily caricatured & stylized--not fitting for a main character who is supposed to be more 'naturalistic' and believable). I should've seen it coming. Pixar never had appealing designs for their human characters. I threw the pics together for the heck of it, sideways title and all. Her look kind of reminds me of the style of the artist who did the artwork for the Harry Potter books. Mary Grand-Pre, I think? She does, sort of. And she has pretty hair! I love all these designs. I think the only one I'm iffy about is the Queen. Don't tell me they're pulling a Tangled and having the mother look as young as her daughter? Yes, she does! I love it! I wouldn't even compare her to Ariel, really. True, they're both "redheads," but Ariel's was a perfect red whereas Merida is the more common orange. I really can't wait to see Julie Walters talking out of that old woman. Anyone else kinda getting a Carl Fredrickson vibe from that old lady? Love that character design. 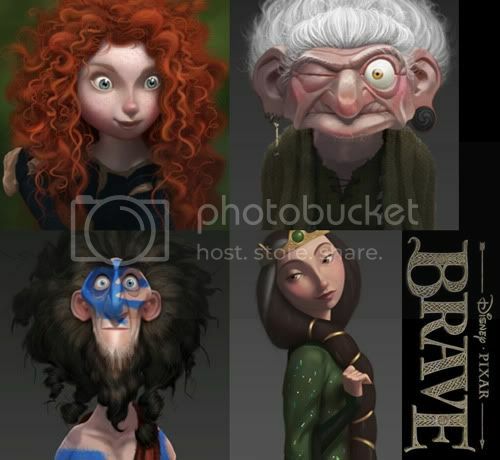 Merida looks a little...off...I think it's her eyes...but this movie is going to be great regardless. Anyone else kinda getting a Carl Fredrickson vibe from that old lady? Yeah, I got that vibe too. The designs are pretty similar. Man with face paint played by ????? Last edited by Sky Syndrome on Thu Jun 23, 2011 10:37 pm, edited 1 time in total. I give Merida a B in looks. Her hair is great! She's pretty, but like Rapunzel, what's with her eyes??? How can they make Merida "ehhhh", but her mom one of the most beautiful CGI women ever??? Oh yeah I totally see it now! Tell me she DOESN'T marry him! Because Pixar having its first Disney Princess ugly, and MARRY that? Gee, I thought John would treat her better than Rapunzel and Tiana together! No, the man with facepaint is one of the Three Lords that helps Merida along the way. Voiced by Craig Ferguson. The fact there's no prince in sight is making me hopeful that this is more of an Action Princess movie and fearful about what the Disney Princess line will do to Merida when they strip her of all identity and throw sparkles on her. Unless those are concept designs, those characters look practically hand-drawn, let alone like they might be moving paintings. You suppose they might give the film a painterly look; something that Rapunzel/Tangled almost went with? I’m glad there’s no love interest. I’ve always felt this was more of a Mulan-type film, with more focus on the heroine and less on love. Also--she doesn't need to be beautiful. Not that she's ugly at all. Lovin Queen Elenor's design along with Merida's design, nice to see that Disney woman isn't afraid to have messy hair kinda tired of seeing 70 yrs worth of straight, long "perfect" hair. As for the creepy Carl woman, yes she has Carl's facial design, but I'm ok with that, she defintly ranks with Snow White's Old Hag as the ugliest villainess and I know who'd go for her, Quasimodo lol, don't get me wrong this films sounds promising for Pixar's 1st fairy tale. You guys really can't tell if that's concept art or not? All four are paintings, with absolute certainty. A lot of you are being way too harsh on especially Merida's design. They will all look as different in the CG as Rapunzel and Flynn did after first seeing sketches of the two of them. I hope they don't change the lead heroine's appearance if she's decided to be "ugly". Disney can do the straight-haired petite stuff, but let Pixar try something different.